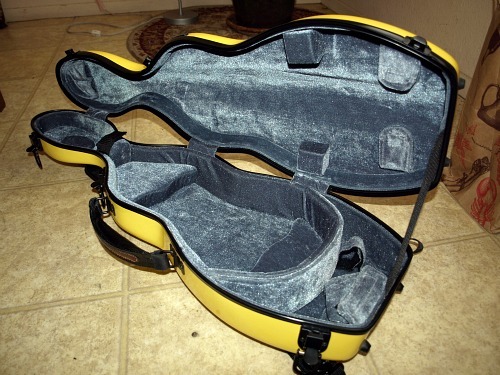 V.com weekend vote: How often do you vacuum your violin/viola/cello case? I have to say that our Violinist.com member Zlata Brouwer made me giggle this morning with her blog this morning, which suggests that "if you don’t want your violin to be eaten by wood worms, you might consider cleaning your violin case once in a while!" While it seems like an exaggeration, she makes an important point! Though I've never seen a person's violin reduced to sawdust by wood worms, I've certainly seen the work of "bow bugs," which seem to thrive in my neck of the woods, southern California. Quite often someone will come to me with the violin from Grandpa's attic, or the violin that they haven't used for seven years, and they will be puzzled as to why all the hairs on the bow appear to be "broken." They weren't broken, they were eaten by bugs, and get that infested violin case out of my house, NOW! Zlata is correct that one should occasionally take the vacuum cleaner to one's violin case, to prevent the dust, little hairs and other junk that can introduce the mites, wood worms and bow bugs into the case. Vacuum them out, before the little critters take up residency and get comfortable in there! But do any of us think to do this? How often do you clean your violin case? If you haven't done it in a while (or ever!) here is your reminder! When I got a new violin case, I started vacuuming it once a week but I've since tapered off to once every few weeks. My violin case has, on occasion, been co-opted by a cat who spotted a cat-shaped, velvet-lined sleeping spot. This, an occasional vacuuming. I've never vacuumed my case, however, I've used tape to remove rosin crumbs and other mysterious things from the insides of my cases. Musicians and students who do not clean their cases most likely do not clean their instruments either. What happens, all the dust, debris, bow worms etc. from the case will stick to the top of the instrument which is sticky with built up rosin. The fiber of the spruce top does not vibrate freely any longer and you wonder why your instrument does not sound great like when you first got it. It is your tool, keep it clean. Masking tape works great, especially with those stubborn, clingy cat hairs. I once had a moth infestation (apparently they were not actually moths) they had a go at everything including case lining. As for cleaning the instrument, that can sometimes be the problem, I had cleaning fluid congeal just inside the f-holes, I could not understand why the instrument sounded muted the whole time. I'm with 69.124.229.143 who recommended keeping one's tool clean. WOW!! I am stunned by how many people have said "never"!!! Question: how had old violins been kept so well for hundreds years before vacuum cleaning ever existed? Zen and the art of violin maintenance - a title for your next book?